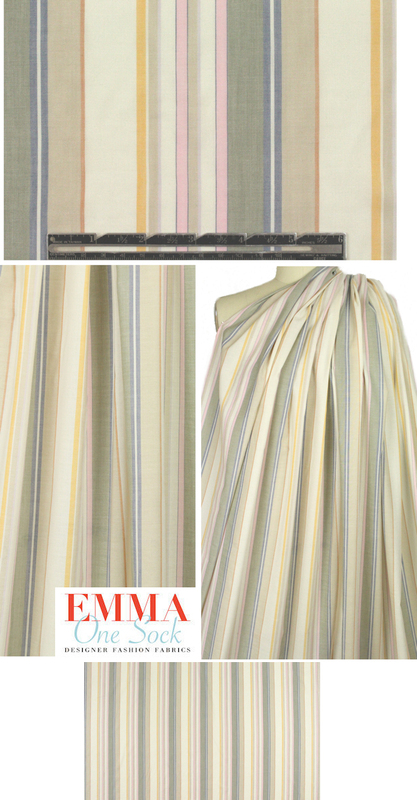 From Italy, this is a lovely Italian yarn-dyed cotton voile, lightweight and semi-opaque with a floaty drape and a refined and soft hand. The vertical stripe pattern has a 4.75" repeat and features soft shades of sage, beige, ivory, pink, apricot, denim, terracotta and a bit of lavender (PANTONE 15-6307, 12-2906, 17-4021, 12-0704, etc.). Perfect for blouses, shirts, tops, tunics, etc. Lining or layering may be needed for some styles. Stripes can be oriented in either direction, and it looks the same on both sides. Please test first if you wish to hand wash and hang to dry, or dry clean.